Does Final Cut Pro support MP4? Actually, it is stated that Final Cut Pro supports MP4, H.264, DV, HDV,3GP, etc. If you can't import MP4 files to Final Cut Pro for editing, it might be the format codec issue. To solve your problem, you need to find a powerful tool that is especially designed for Final Cut Pro. Convert MP4 to Final Cut Pro and iMovie with the native codecs like ProRes, Apple Intermediate Codec and DNxHD. Convert MP4 to or from any format including MOV, MKV, AVI, and even 3D & HD videos. Burn videos in any format to DVD or Blu-ray disc with many built-in menu templates. Download or record video from YouTube and other 10,000 sites. The tutorial below is based on Mac OS. 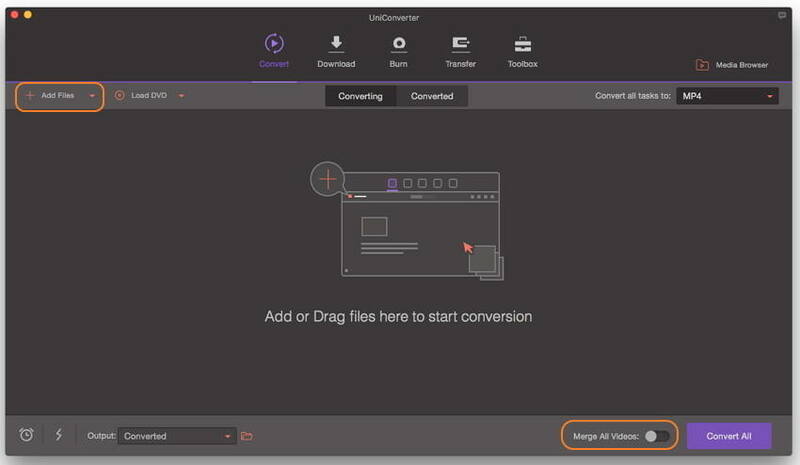 If you want a video converter for Windows (Windows 10 included) to convert MP4 videos, just follow the tutorial guide as below. Step 1 Add MP4 videos to this MP4 to FCP converter. 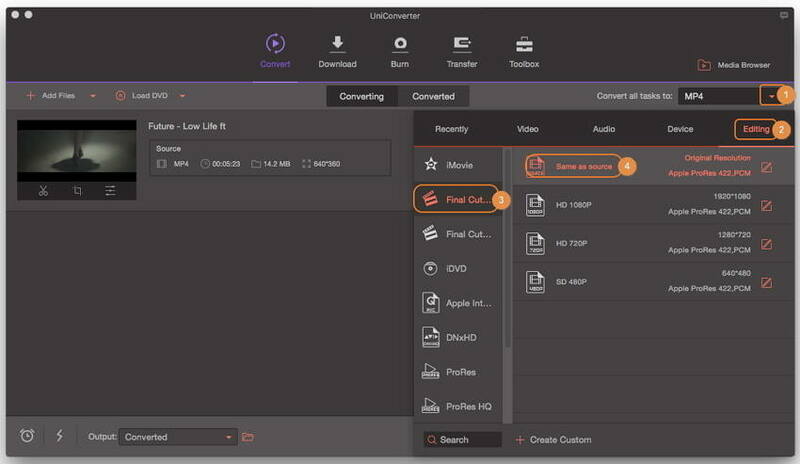 Download and run this MP4 to FCP converter. Click Add File and browse files to load your MP4 video or directly drag and drop your local MP4 files into this app's pane. After importing them successfully, you can preview the MP4 videos by clicking the video thumbnails, or re-arrange these videos by freely dragging the target video to the place you want. Note: If your files are segmented and you want to combine them together into a big one before you import files into FCP, at this time, you can switch on the Merge All Videos switch at the bottom. Immediately, there will be a chain between every two videos. Step 2 Choose Final Cut Pro as the output format. 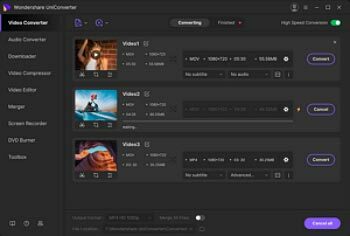 This app offers you an optimized format for Final Cut Pro in the Editing format window, as well as ProRes, Apple Intermediate Codec and DNxHD options. Here, you can directly choose the optimized preset as the output format and the related resolution. Of course, you can choose a native codec to encode your files for editing in FCP. Step 3 Start MP4 to FCP conversion. When everything is done, click the Convert All button at the bottom-right corner to finish the conversion. 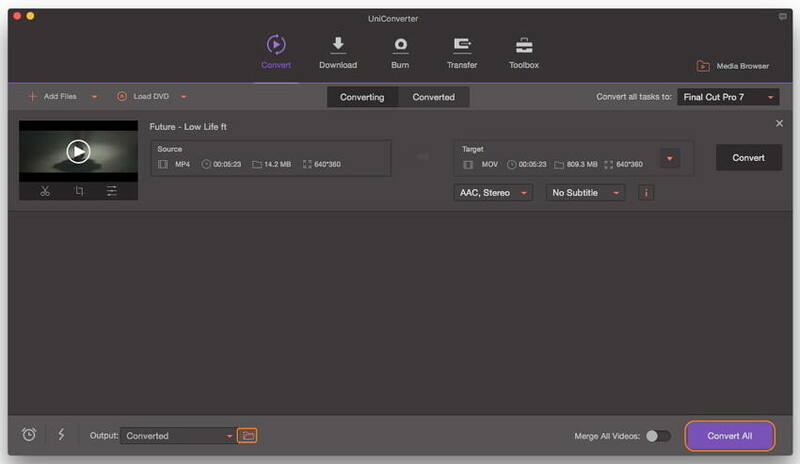 While you wait, have a coffee or take a nap and let Video Converter do the work in the background. After a while, you can import the output files to Final Cut Pro to edit without any trouble. And the output video will not decrease in video quality. And the output path has already listed at the bottom of the main interface. You can quickly and easily find the output files according to the file path. Of course, you can change the file path by yourself if need. Final Cut Pro is a series of non-linear professional editing software developed by Macromedia Inc. firstly and then Apple Inc. The latest version, Final Cut Pro X 10.3, can run on Intel-based Mac computer powered byOS X 10.11.4 or later. With Final Cut Pro, you can edit video like trimming, applying effects, managing media files and so on. Learn more about Final Cut Pro.